Learning how to make bone stocks is such an important kitchen skill. As a Nutritional Therapist it is one of the most important foods I utilize with my clients, especially for digestive issues. Bone stocks (also called bone broths) have been used almost universally in all native cuisines around the globe and form the foundation for things like gravies, sauces, soups and stews. 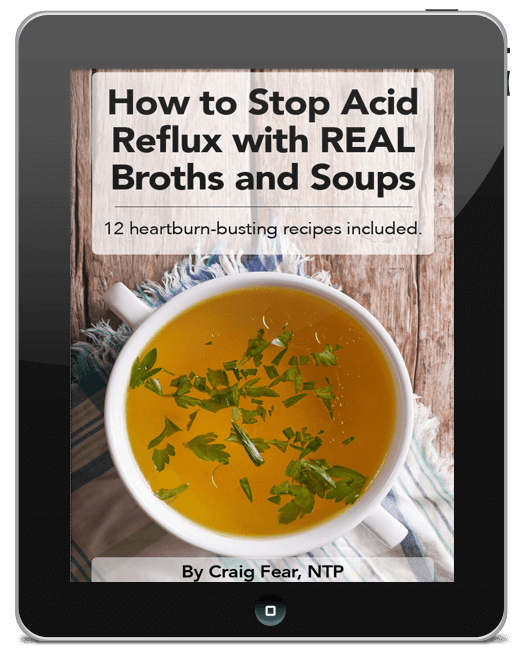 Unfortunately, most Americans have lost touch with how to make bone stocks and instead rely on bouillon cubes and canned stocks which are heavily watered down and use flavorings and chemicals like MSG to mimic the flavor of real bone stocks and broths. 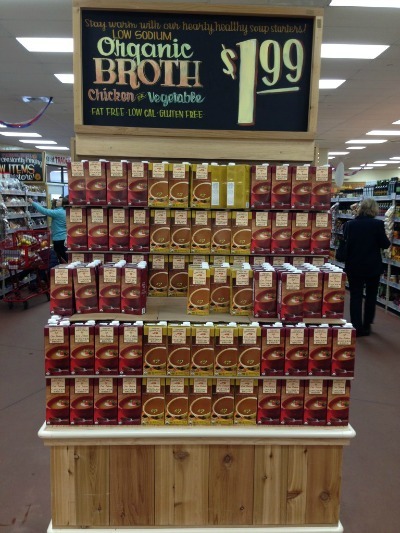 I hate to break it to you but these popular organic boxed broths aren’t real stocks either. Trust me, I know they’re convenient! Certainly, they’re better than bouillon cubes BUT let’s be clear why they’re not real stocks. 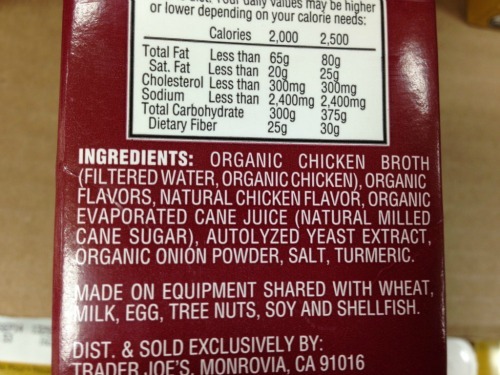 Take a look at the label of the above pictured organic chicken broth from Trader Joe’s. The first ingredient is organic chicken broth. Sounds good right? But look at how they define chicken broth in the parentheses that follow it. What they’re not telling you is how long (if at all) they’re simmering that organic chicken in the filtered water. I highly doubt it’s very long because if it was, most of the remaining ingredients would be completely unnecessary! Most of those ingredients are flavorings that mimic the flavor of real stock. And though it may fool your taste buds, I promise you it’s not fooling your body. Real homemade bone stocks derive their nutritional benefits (and taste) from simmering bones for long periods in water which slowly leaches out the nutrients. This is almost certainly not happening with store-bought boxed versions. This leaching of nutrients includes not only the minerals from the bones but also the nutrients that are contained in the meat, skin, bone marrow, cartilage and tendons that attached to bones. These fibrous tissues are composed of a dense network of proteins known as collagen which also break down in a good broth and reassemble themselves into the strong but pliable tissues in our body such as our joints, skin and nails. In fact, you may have heard of two such components of collagen, glucosamine and chondroitin sulfates which are sold as supplements for those with joint problems such as osteoarthritis. Another component of collagen is gelatin which is a waxy substance that forms when broths cool (and it is non-existent in organic, boxed broths). It’s the key ingredient that gives Jello its jelly-like consistency and it has been prized for centuries by cultures around the world for its numerous health benefits, in particular, easing gastrointestinal discomfort. Your Grandma (or maybe great Grandma) almost certainly knew this and observed over and over how a homemade chicken soup made from a real chicken stock can help one recover from things like the common cold and indigestion. However, the fact remains that few people make bone stocks from real bones anymore. I know it can be a little intimidating for many folks. So I’ve come up with a simple five-step formula to help make bone stocks more practical. And because each of these steps begins with the letter S you may even be able to memorize it. Soak 1 – 1 ½ pounds bones per quart of water. Add ¼ – ½ cup of vinegar. Let sit for about 60 mins. The vinegar helps pull the minerals from the bones. You can add chopped vegetables here as well to add more aroma and flavor though it’s not absolutely necessary. The classic combination (called a “mirepoix”) is onions, carrots and celery. Add about 2-3 carrots, 2-3 celery stalks and 1 medium to large onion per 3-5 pounds of bones. Bring to a boil and skim scum that forms on the surface. Without skimming the broth will become cloudier and slightly affect the flavor but it’s not that big of a deal. Certain stocks and types of bones will produce more scum than others. This is probably the most important step! The key is to GENTLY SIMMER and not boil the bones which can damage the gelatin. So once the water has boiled and the scum forms, immediately turn down the heat. Simmering should only be slightly perceptible – a few bubbles rising to the surface here and there is a good indicator of a nice, gentle simmer. Turn the heat off and let the broth cool for a few hours. Remove the bones with a slotted spoon. Line a colander with cheesecloth and strain into wide mouth glass jars. Let cool in your kitchen a few more hours. Store whatever you’ll use for the week in your fridge. A layer of fat will form on top of the stocks which will act like a seal and preserve your broth for up to 10 days in the fridge. Freeze whatever you won’t use for long-term storage. Many people ask me where they can find good quality bones. Contact your local farmers, your local butcher or even the meat department at your local health food store. So few people value bones anymore that they’ll probably be thrilled to give them to you at a very reasonable price. Once you find a good source, try to get as as many different types of bones and parts of the animal as possible. For example for chicken stock, get some chicken necks, backs and chicken feet. For beef stock try to get the oxtail and use a combination of meaty bones, knuckle bones and marrow bones. Some of these additional parts are easier to get than other so if you can’t get a good variety, it’s no big deal. And if using chicken feet grosses you out, just skip it! You can also build up your supply at home by saving bones in your freezer until you have enough to make a stock. And it’s perfectly acceptable to combine bones from different animals. I’ll often throw pork, chicken and beef bones together. But my biggest piece of advice is to keep experiment and learning. 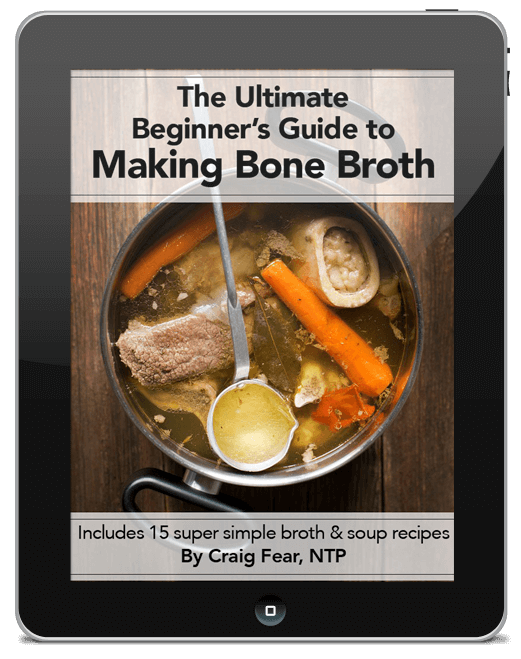 Once you learn to make bone stocks on a regular basis you’ll constantly find new recipes and ways to use them. The possibilities are endless! 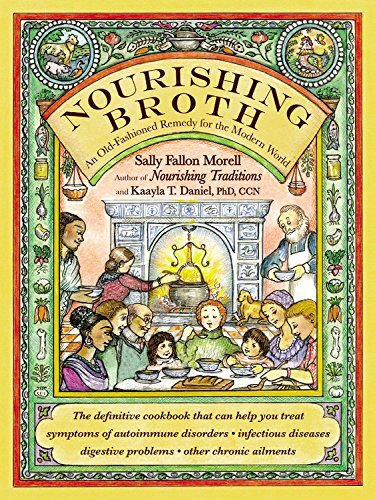 Nourishing Broth is the new book by Sally Fallon and Dr. Kaayla Daniel and it is chock full of recipes for different types of stocks and stock-based soups, stews, sauces and stir fries. 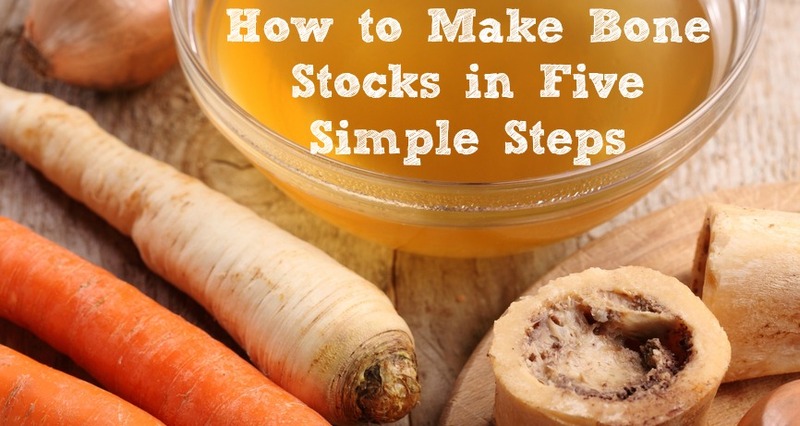 It also includes some great information on the proven health benefits of homemade stocks for digestive issues, osteoarthritis, skin issues, mental health, anti-aging and even cancer. I promise this book will become a staple in your kitchen for decades to come. 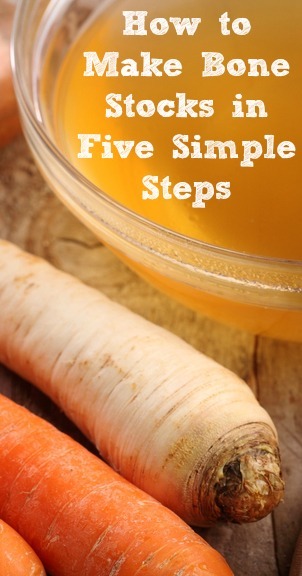 Click here to learn more about Nourishing Broth.